When we gardeners lay out our vegetable or flower beds, we often limit ourselves to the ground at our feet. But vertical space is plentiful and should be considered as a way to maximize our gardens. Growing different types of vining plants is enjoyable and coming up with ways to support them is half the fun. Every year, I grow some types of veggies that either need upright support or have the potential to be grown vertically. These include peas, beans, cucumbers, small winter squash and mini pumpkins. In the past, I’ve used 4-by-8-foot sheets of concrete-reinforcing wire to support my peas. This year, I’m using natural materials like branches to provide support for many of the plants in my garden. Along the edges of the pea patch, I poked in small, stiff branches for them to wrap their tendrils around and climb. 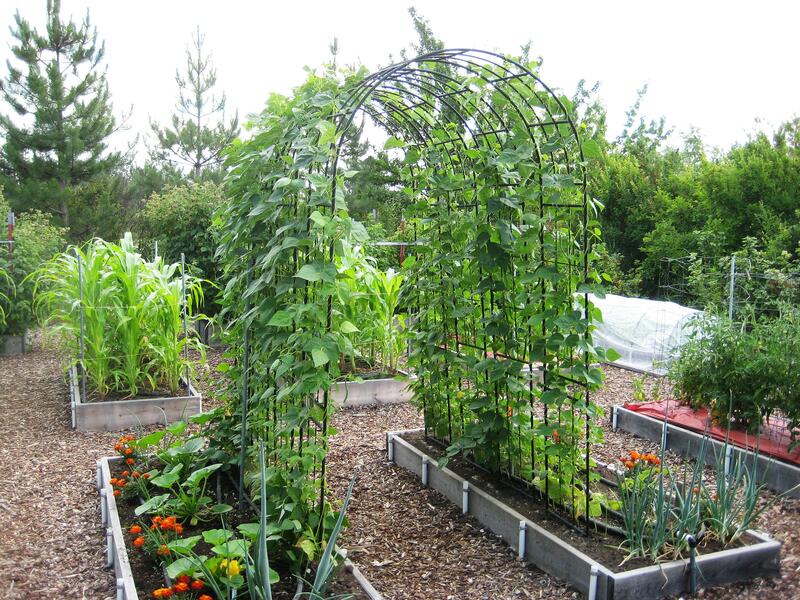 I grow my pole beans up and over an arbor that spans a path in the vegetable garden. This is a space-saving method, and since the arbor is quite tall, it easily accommodates their 6-foot-plus vines. I will be growing two types of cucumbers, Lunchbox and cucamelons, on obelisks made from saplings, vines and branches. The cucamelons, also known as mouse melons or Mexican sour gherkins, are a new addition to our garden. I’ve been hearing rave reviews about their fresh taste and crunch and am anxious to see how they perform. Examples of small winter squash that would be ideal for growing vertically include Sweet Dumpling, Delicata and Acorn. Some of the larger varieties would be a bit heavy unless you are able to provide slings or other supports to prevent the fruits from pulling down the vines. Another new vining veggie that I’m growing this year is Red Malabar spinach. They have lovely heart-shaped leaves and burgundy stems, so in addition to feeding us, they should be quite attractive. Although it’s an entirely different species (Basella rubra) from common spinach, it is used in the same manner, whether eaten raw or cooked. If you don’t have a vegetable garden or it’s small in size, remember to take advantage of arbors, trellises or fences in other areas of your yard. Even tree trunks can provide vertical space, provided the plants will get enough sunlight. For the flower garden, there are many climbing annuals that would make delightful additions. Examples include black-eyed Susan vine (Thunbergia), cardinal climber (Ipomoea x multifida), canary bird vine (Tropaeolum peregrinum), cup-and-saucer vine (Cobaea scandens), morning glory vine and nasturtiums (Amazon Jewel, Climbing Phoenix, Moonlight, Spitfire, Tall Mix). Morning glory is often confused with the invasive and much-dreaded field bindweed but is actually quite a well-behaved vine. One of my favorite cultivars is Grandpa Ott, which features deep blue blossoms with purple throats; it’s a real stunner. This year, I’m trying a new cultivar from Burpee called Party Dress that has magenta flowers with white throats. To add fragrance to the garden, consider growing sweet peas (Lathyrus odoratus). Since there are many cultivars that don’t have a scent, read the seed packets carefully to find ones that do. Look for April in Paris, Black Knight, Miss Willmott, Perfume Delight and Queen of the Night. Most of the above-named vines will attract hummingbirds and bees, making them a plus for all gardens. As you plant your flowers and vegetables this spring, remember to expand your garden by going up rather than out. Susan Mulvihill is co-author, with Pat Munts, of “Northwest Gardener’s Handbook.” Contact her at Susan@susansinthegarden.com. Watch this week’s “Everyone Can Grow A Garden” video on my YouTube channel, youtube.com/c/susansinthegarden.